The NuVue Pop-UP Greenhouse can allow you to start the growing season off right by providing protection from harsh weather conditions in the spring allowing you to get a jump start on the growing season. Size is 22" Wide X 22" High and comes complete with 4 ground spikes to secure to the ground. Provides protection from strong winds, heavy rain, overnight frost, insects and other pests while allowing the sun's light to warm the soil and accelerate the growing process for a lush, healthy plant. 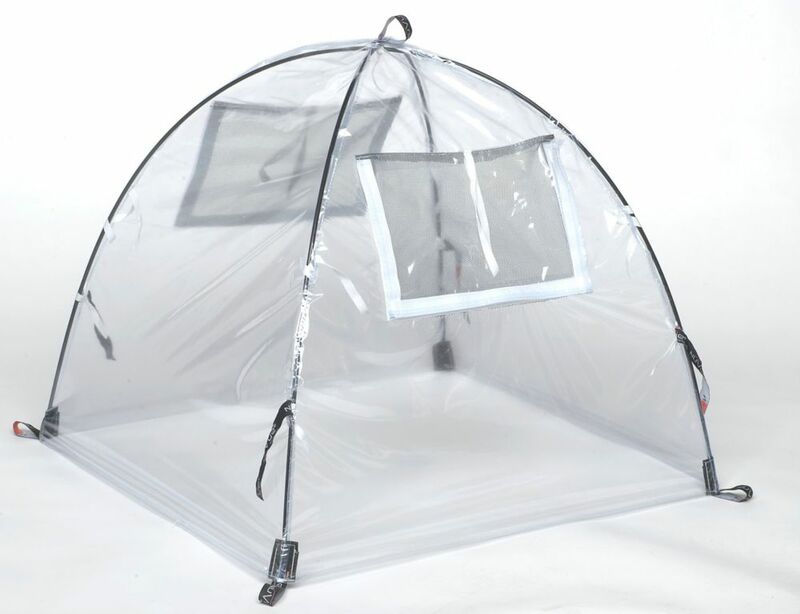 Pop-Up Greenhouse 22-inch x 22-inch Greenhouse The NuVue Pop-UP Greenhouse can allow you to start the growing season off right by providing protection from harsh weather conditions in the spring allowing you to get a jump start on the growing season. Size is 22" Wide X 22" High and comes complete with 4 ground spikes to secure to the ground. Provides protection from strong winds, heavy rain, overnight frost, insects and other pests while allowing the sun's light to warm the soil and accelerate the growing process for a lush, healthy plant. Pop-Up Greenhouse 22-inch x 22-inch Greenhouse is rated 4.4 out of 5 by 7. Rated 2 out of 5 by Cape from there is nothing to assemble ie a plus.There is no... there is nothing to assemble ie a plus.There is no way to keep the air circulation screens open all the time, the wind closes the twoscreens and burns the plants inside.I kept it , with an adhesive tape to keep the two screens open all the time. Rated 5 out of 5 by Ronni from They work well and I bought 3 of them so deer will not eat my plants. They work well and I bought 3 of them so deer will not eat my plants. Rated 5 out of 5 by teacher from Very flexible, convenient for small spaces. We used this in our classroom to start plants before planting outside. It was a perfect size for 20 small plants and there was still extra room. It folds up flat for easy storage until next year! Rated 5 out of 5 by housedad from Worked as advertised. Was very pleased with the quality, especially for the price. Worked as advertised. Was very pleased with the quality, especially for the price. Rated 4 out of 5 by Treeperson1 from easy to assemble, we will see if it can handle snow cover. easy to assemble, we will see if it can handle snow cover.